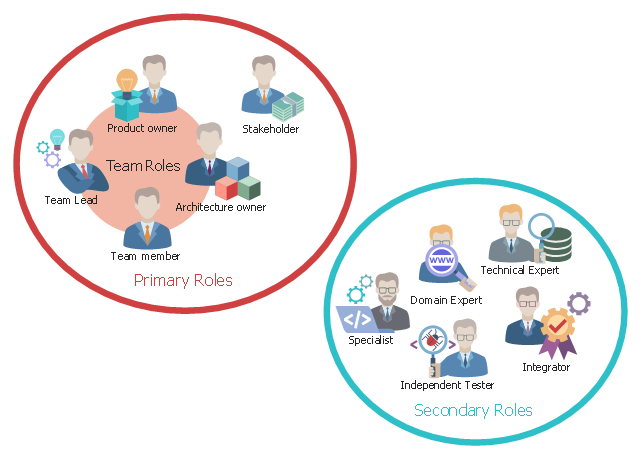 This agile software development infographic example illustrates roles in disciplined agile delivery (DAD). 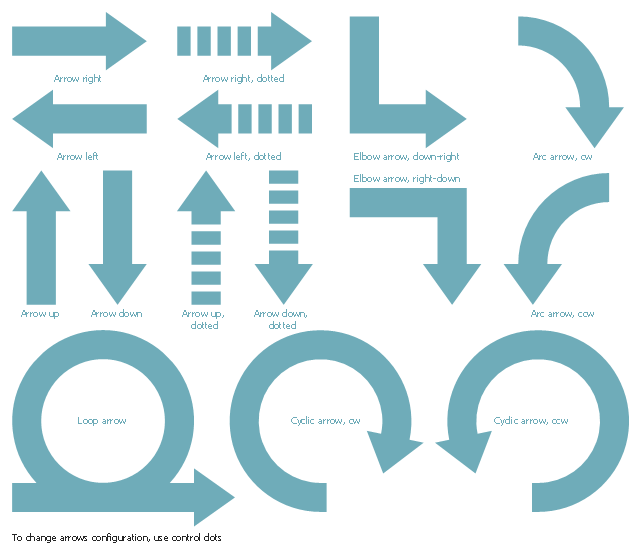 The vector stencils library "Scrum arrows" contains 15 shapes. Use it to design your agile software development diagrams and scrum infographics with ConceptDraw PRO software. The vector stencils library "Scrum people" contains 30 icons: scrum master, product owner, development team, etc. 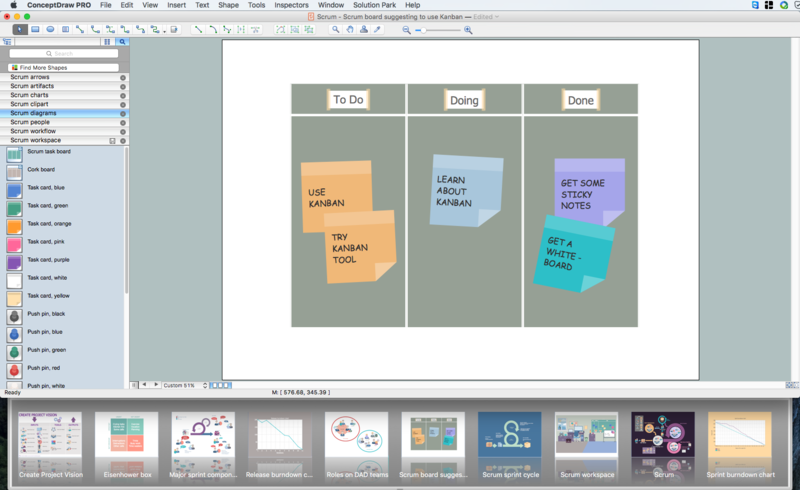 Use this clipart set to design your agile software development diagrams and infographics with ConceptDraw PRO software. The vector stencils library "Scrum artifacts" contains 52 icons. 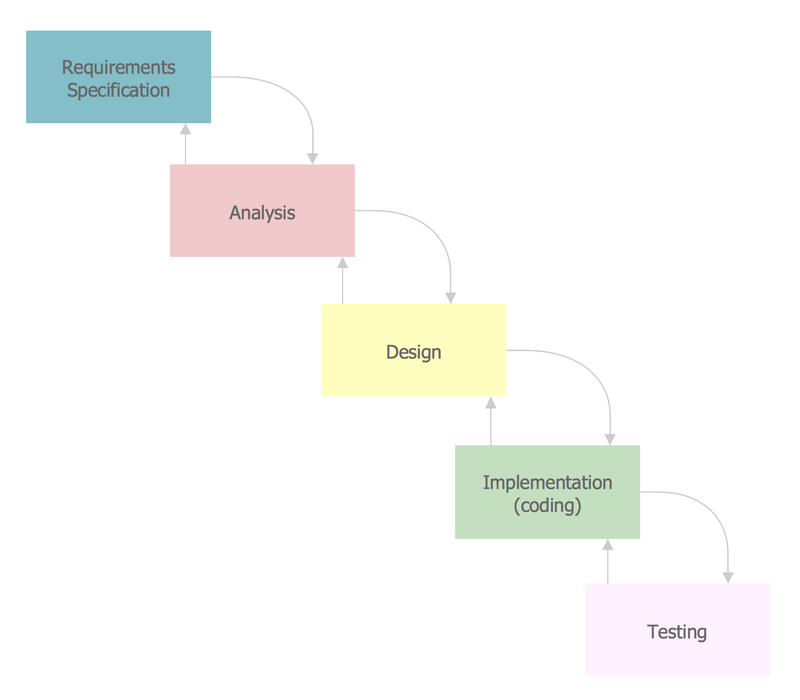 The sprint backlog is the list of work the development team must address during the next sprint. The list is derived by the scrum team selecting product backlog items from the top of the product backlog until the development team feels it has enough work to fill the sprint. This is done by the development team asking "Can we also do this?" and adding product backlog items to the sprint backlog. The development team should keep in mind its past performance assessing its capacity for the new sprint, and use this as a guide line of how much "effort" they can complete. The vector stencils library "Scrum workflow" contains 39 icons. 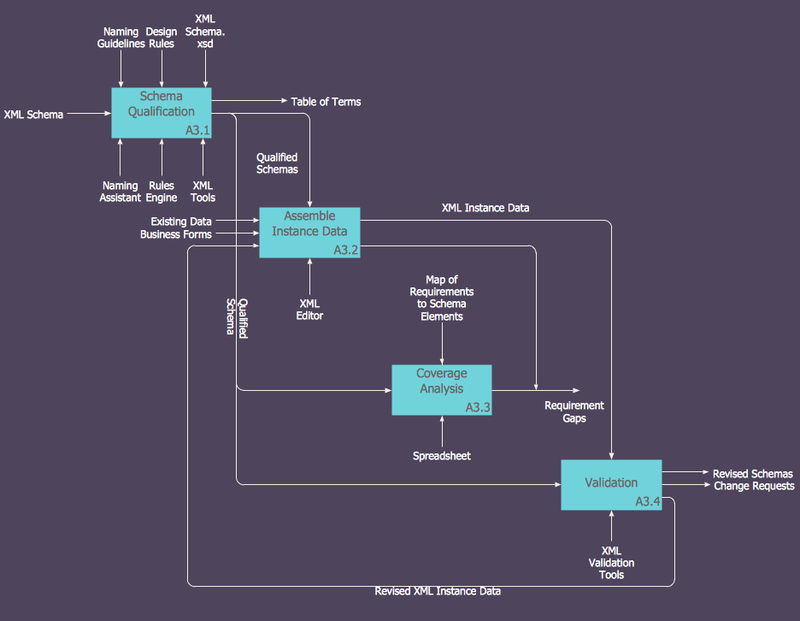 Use this clipart set to design your agile software development diagrams and flowcharts with ConceptDraw PRO software. 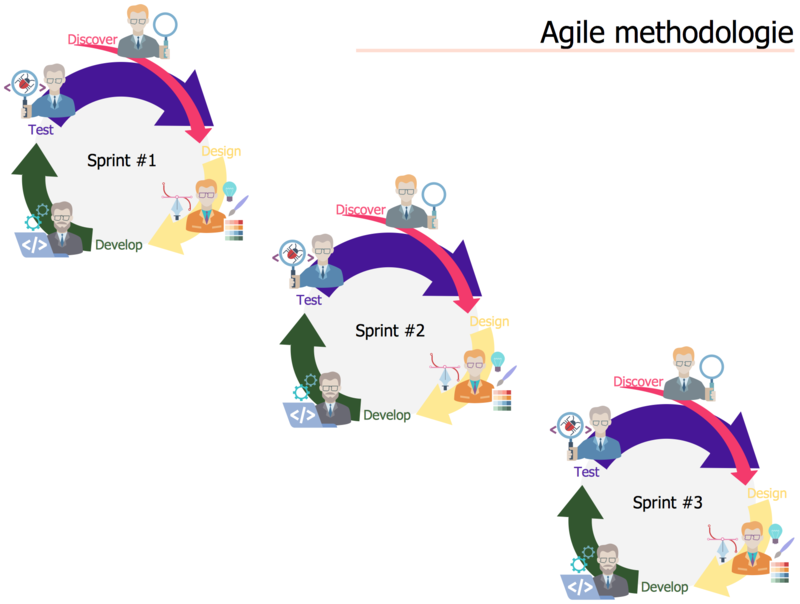 "A sprint (or iteration) is the basic unit of development in scrum. The sprint is a timeboxed effort; that is, it is restricted to a specific duration. The duration is fixed in advance for each sprint and is normally between one week and one month, with two weeks being the most common. Each sprint starts with a sprint planning event that aims to define a sprint backlog, identify the work for the sprint, and make an estimated commitment for the sprint goal. 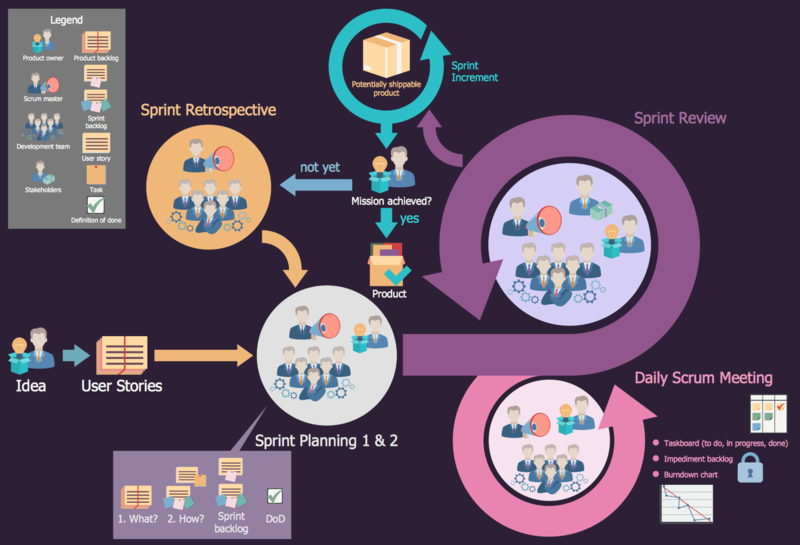 Each sprint ends with a sprint review and sprint retrospective, that reviews progress to show to stakeholders and identify lessons and improvements for the next sprints. 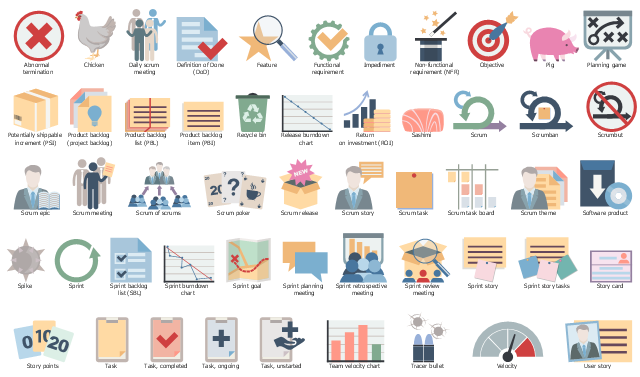 The vector stencils library "Scrum workspace" contains 21 icons. Big Visible Charts. 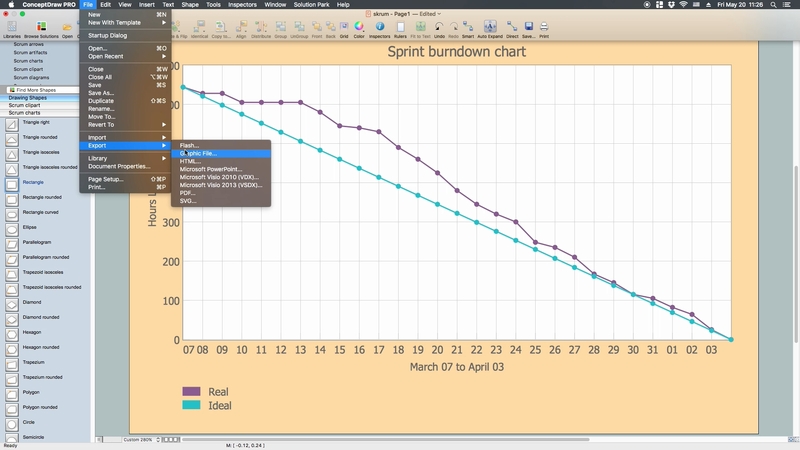 ... the sprint burndown chart, showing the number of hours remaining as of each day of the current sprint. ... big visible charts showing the number of passing customer acceptance tests, the pass/fail status of tests by day, sprint and release burndown charts, number of new stories introduced to the product backlog per sprint, and more. Additional feedback devices. In addition to big, visible charts, it is common for an agile team to use additional visual feedback devices in their workspace. One of the most common is a lava lamp that is turned on whenever the automated build is broken. The product backlog. One problem with running an endless series of sprints is that each can feel disconnected or isolated from the whole of a planned released or related set of new capabilities. A good way to reduce the impact of this problem is by displaying the product backlog somewhere clearly visible. ... tack the index cards with those upcoming user stories on a wall where all can see them. 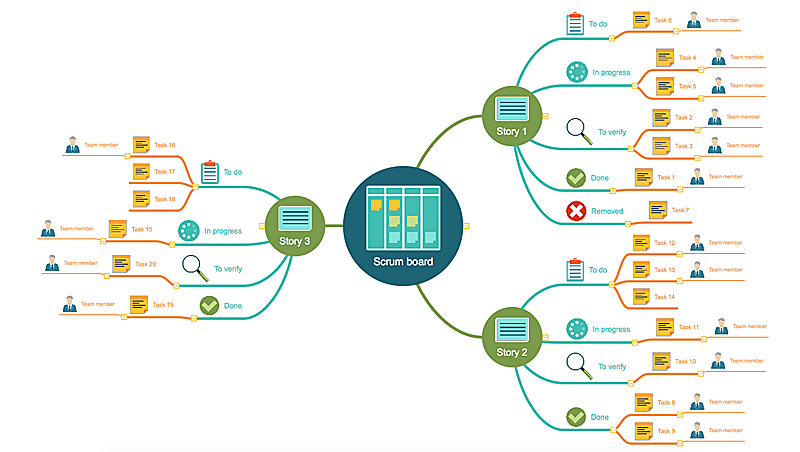 This allows team members to see how the user stories they are working on in the current sprint relate to others that are coming soon.